Arabsat has announced the deployment of affordable satellite broadband services across Africa under the new Arabsat Broadband package. In the company's first collaboration for Africa, the partners have teamed up to create a managed resource to deliver highly affordable broadband based on Arabsat capacity and hardware from Forsway. The regional service model was designed and implemented by satellite services consultants at Developing Infrastructure. In partnering to provide broadband to underserved regions, the companies are bringing together the unique combination of resources and expertise to help foster growth across the continent. Internet services will provide critical access to community services, education, health information, business opportunities, entertainment and more. 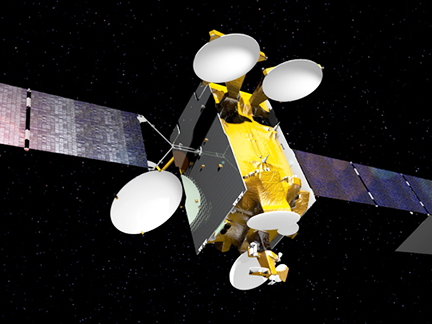 Artistic rendition of Arabsat's BADR-7 satellite. The Arabsat Broadband model will enable increased capacity for broadband and minimizing network congestion to provide great customer experience with faster internet access, at reduced costs. The joint service model is powered by Forsway customer premises equipment and Arabsat’s BADR-7 satellite to enable connectivity in hard-to-reach and urban areas in the Middle East and most of Africa, according to Wael Mohammed AlButi, VP & CCO of Arabsat. Tobias Forsell, CEO, Forsway, said that the company is excited to be working with Arabsat, a leading satellite operator, to create a new way of delivering highly cost-effective broadband services in Africa. Tapping Forsway's hybrid technology, the company is helping Arabsat Broadband Services enable rapid deployment of robust, satellite-based internet services and eliminate the need to deploy costly additional infrastructure. The Forsway Odin F-50 technology is furnishing Arabsat Broadband Services with a competitive, low-cost alternative to VSAT for the new Arabsat Broadband service model and offering. Travis Mooney, Principal Consultant of Developing Infrastructure, added that the satellite industry needs to look for new markets, products, and services in order to compete. Innovative companies such as Arabsat see that there are different services that can be brought to market, expanding their portfolio, and enter into completely new verticals. Arabsat Broadband will do just that — expand access to the Internet and better the lives of its users.